At InLine, we don't expect anyone to adapt their manufacturing process to any specific machine. We'll engineer an InLine washer to fit your specific needs. Each one of our industrial washers is mobile and adaptable to accommodate changing manufacturing processes and cleaning needs. InLine parts washers pack more features and more cleaning power into a small, extremely efficient package for unmatched overall efficiency. InLine is the answer for cost-effective pass-through cleaning. 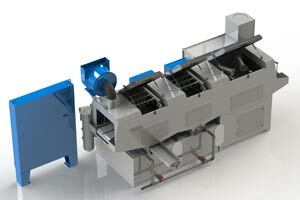 InLine parts washers minimize environmental impact. Every machine uses a closed-loop wash system to consume less water and includes a standard automatic oil skimmer to remove petroleum-based products from the wash solution. Inline Cleaning Systems has manufactured engineered parts washers for over 30 years. We are a privately owned company that specializes in the manufacture of conveyor or pass through washers and cleaning systems. The company is supported by a team with over 100 years experience in the design-build of specialized equipment for cleaning, material processing and handling, robot assisted applications and system integration. Our goal is to provide our customers with the most efficient cleaning solution for their product. Please contact contact us for a cleaning solution that will meet your specific needs.